From papaya stalks to bamboo stems, they are leaving no cylindrical objects unturned. When one door closes, another opens. While the plastic ban that was announced by the Tamil Nadu Government six months ago came into effect from January 1, 2019, might have come down hard on one section of people, there are those who are finding interesting alternatives to replace plastic. While a lot of folks have started switching to mandarai leaves, banana leaves and betel nut plates for packing food and such items, these tender coconut sellers from southern Tamil Nadu have found ingenious ways to replace plastic straws. Thangam Pandiyan, a resident of Madurai and an organic farming enthusiast was quite intrigued by choice of a seller to use papaya stalk to serve fresh, cool tender coconut at Maravankulam bus stop. “He had collected them from his own farm and these are available in plenty in papaya farms usually. This is the stalk that bears the fruit and the leaves. And farmers usually keep trimming the leaves so there’s plenty of stem available. It is interesting that he has made use of them,” shares Thangam. The stalks that are semi sun-dried (mainly for the papaya milk) have become quite sturdy in the process, he says. “Also, it does not bend easily like how a plastic straw would and is easier for children to drink as well,” he observes. An organic farmer himself, Thangam shares that in addition to papaya, most kinds of grass can be used for this purpose. “There are very few plants with a hollow stalk like that of a papaya’s. If you take corn stalk it has a spongy filling inside, which makes it unfit to be used as straw. 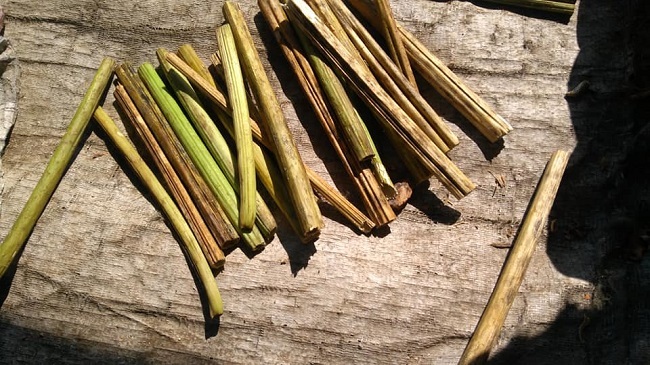 However, we do have the hardy sugarcane grass known as naanal in Tamil (botanical name: Saccharum arundinaceum), and plain old straw (vaikol in Tamil), can also be used to serve the purpose,” he says. Yet another seller has come up with an innovative idea, and this time it is from the picturesque town of Tenkasi in Tamil Nadu’s Tirunelveli district. Surrounded by Western Ghats, this town is as green as Tamil Nadu, a state on the wrong side of the ghats, can hope to get. 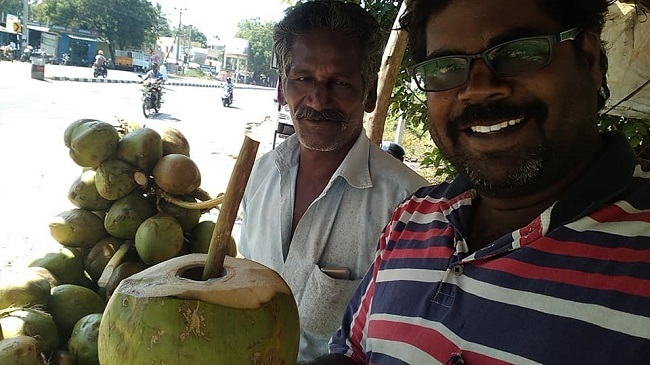 J Shanmuga Nathan, a resident of Tenkasi, tells us about the now famous tender coconut seller near the Essar Petrol pump between Tenkasi and Idaikal for his bamboo straws. “Just right across the other side road, he found plenty of Bamboo stems which he thought he’ll make straws out of. From one bamboo he can make about 6 to 10 such straws,” says Shanmuga Nathan. “Bamboo added its unique flavour to the tender coconut. It was quite refreshing,” he adds. While Shanmuga Nathan is in awe by the tender coconut seller’s idea, he also shares that the plastic ban is a move that has to be welcomed. “People are switching to greener alternatives. Earlier we had groceries packed with paper and jute strings. Today, most of the pollution is done by big corporate brands. The ban will be meaningful only if these brands are made to find other alternatives,” he adds.